An example of handwritten records from the Pitminster, Somerset, parish register. The date is 1680. Some of the capital letters are particularly difficult to decipher and I have created an example sheet (84Kb) as an aid. 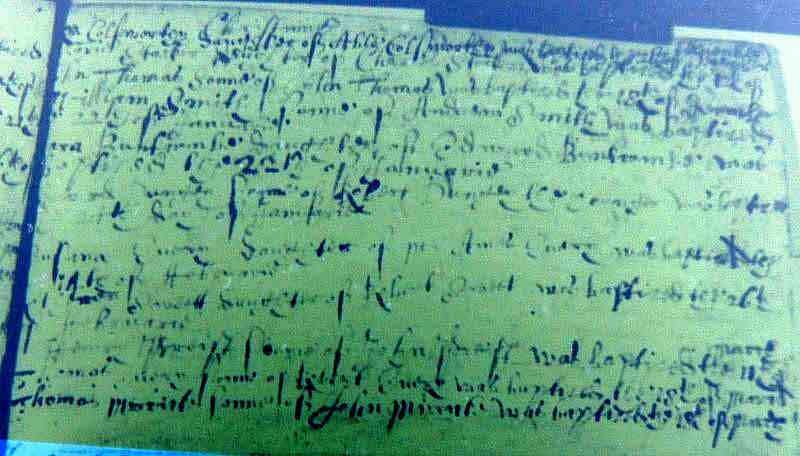 An example of handwritten records from the Thurlbear, Somerset, parish register. At this date, after about 1700-1750, the handwriting is familiar. An example of scrawled and faded handwritten records from the Pitminster, Somerset, parish records and my transcription. The very earliest records are the most difficult. 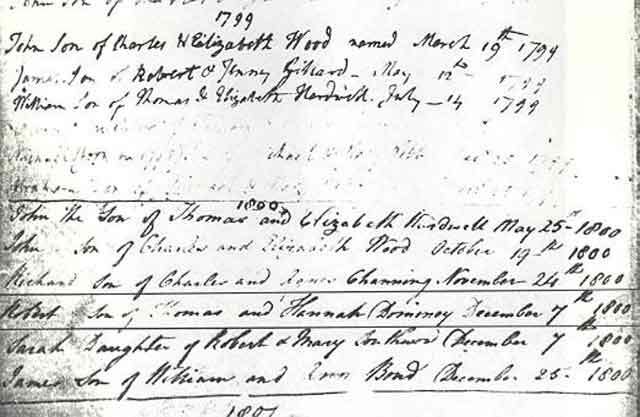 Despite the above examples, records after about 1780, and even more so after about 1812, are normally no more difficult to read than some handwriting today. Please remember that it is advisable not to rely on a transcription for information - it is recommended that the source document should be checked. This is particularly the case if an event is unexpectedly not found - reference to the original document may reveal that it was recorded after all. As anyone who has ever done any transcribing from hand-written records can confirm, errors can be introduced by the state of the document, the legibility of the ink image, the style of handwriting, and simple omission. When using fiche, there is a possibility of further errors caused by a less than perfect photographic image. Another reason for checking the source is that there may be additional information which could not be transcribed in the space available. Be prepared for idiosyncratic spelling of names and places. More often than not our ancestors could not read or write. They probably told someone else what was needed to be written, and that person wrote down what he heard. As an example, the Pitminster SOM baptisms contain three different spellings of my own surname: PARKHOUSE, PARKHOAST, and PARKHURST, which obviously are the same family when reconstructed using baptisms, marriages and burials. If your name is Smythe, you should consider the possibility that it may once have been entered in a parish register as Smith. Place-names can be anything from a single homestead to a large city and may not be fully spelled out. Bear in mind the context, e.g. in Pitminster SOM, reference to an Ordnance Survey map would suggest that the place-names Shoreditch and Feltham are more likely to refer to local places than like-named places in London, and Blagdon is more likely to be the Blagdon Hill in the parish than the Blagdon 30 miles away. Still on the subject of place-names, David Hey in his excellent book "Family History & Local History in England" (on page 223 in my 1994 impression) explains how he located a place called Nacker's Hole in Otterford SOM. With the aid of a 1:25,000 Ordnance Survey map, he found a place called Knacker's Hole Lane, a lonely spot on the Devon/Somerset border where once horses had been slaughtered. The house of his ancestor was still there. When transcribing from old handwriting, it is sometimes possible to read an entry in different ways. If after reconstructing a family from my transcriptions, you feel that I may have transcribed something incorrectly, let me know. If I am not too busy, I will re-examine the fiche (if I still have it) and see if your alternative interpretation is possible. Otherwise, I would point out that you can always purchase the fiche yourself from the Somerset Record Office. I'm NOT responsible for any damage that information derived from this site may cause to your family tree!